Here is a drill that incorporates lots of shots, passing, and timing. Four equal lines of players are in all four corners with pucks. The first two players from opposite corners start the drill by carrying a puck a couple of strides transitioning backwards and making a pass to the next player in line. After the pass they skate into the slot to receive a pass right back and take a shot. After the shot they continue low into the opposite corner and face up ice as quickly as posssible to receive a pass from the defensive player. The defensive player has skated to the middle of the ice to create a good passing angle. 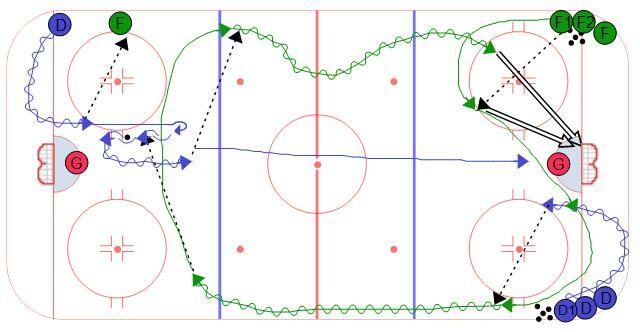 After they make the pass they skate up to the blue line and transition back into their own zone to receive a pass from the forward that started on the other side. The defense transition while controlling the puck and again, create a good passing angle by gaining the middle of the ice and stepping up in the play. After they make the pass to the forward they join the rush for a 2 on 0 at the other end. The two keys to this drill are the passing angles, encourage players to make horizontal passes instead of long verticle passes. This requires timing from both players involved. The other main point for forwards is to face up ice as quickly as possible in transition.